rigorousintuition.ca • View topic - UFO photographs. New video footage showing a suspected triangular UFO hovering over the Germany sky has reignited the age-old debate of the existence of aliens. The video was recorded in June this year, but another two more similar videos showing UFOs flying over the Brazil sky only gives strength to those who believe in aliens. The Germany UFO sighting video was uploaded on YouTube by O7TV. It shows the filmer having fun with his son in a park, when he spotted the uninvited guest on Earth. A debate is now raging over the video's authenticity. Meanwhile, Scott C Waring from the popular website UFO Sightings Daily has claimed that the video is 'real'. "The fact that the person blurred out the face of the kid and didn't get the UFO in the dead center of the video is what causes me to believe this is real. Also, the lighting and shading on the UFO matches that of the trees and the bars of [the] jungle gym," Waring said. Last edited by semper occultus on Wed Sep 24, 2014 9:53 am, edited 1 time in total. Yer welcome. It's frustrating, I know. It really does seem that our modern go-to Occam's Box-cutter for UFO "evidence" is ... "is this PR / viral / stealth marketing?" 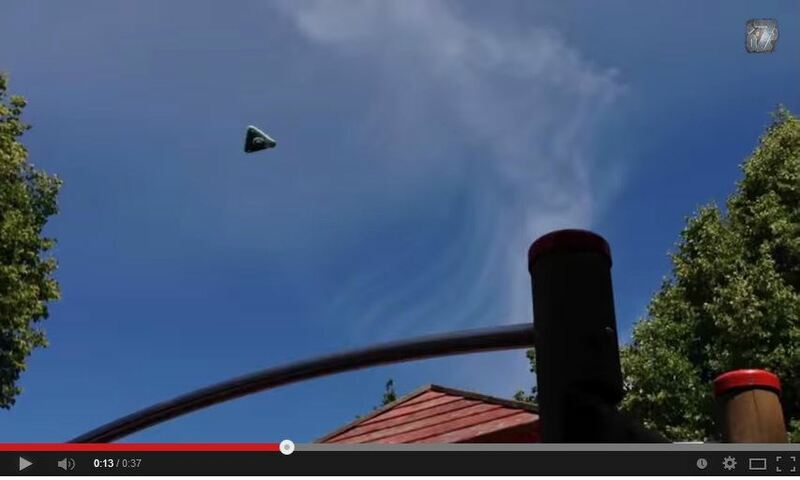 Koi UFO Video 059 is a video appearing to show two jet fighters escorting a UFO. As detailed below, it is a hoaxed UFO signed (pun intended) by the hoaxer, "Oondyla". Many UFO hoax videos in fact indicate their creator, in the same way that some crop circles were signed by their creators. In short, the video is signed (pun intended) by the hoaxer on a road sign that appears at the end of the video. At the end of the video, the image zooms out and a road sign becomes visible at the bottom right of the screen. If you enlarge that part of the video, you can see the name "Oondyla". (1) A video illustrating his skills in creating video special effects. (2) Other UFO videos that happen to have the name "Oondyla" on signs in the videos.